Here’s the link to the Saboteur Awards. You have to vote in at least three categories. A vote for I am not a silent poet in the Wildcard Category from all our readers and members of the associated Facebook group pagewould be more than welcome. Let’s see if we can win this year! 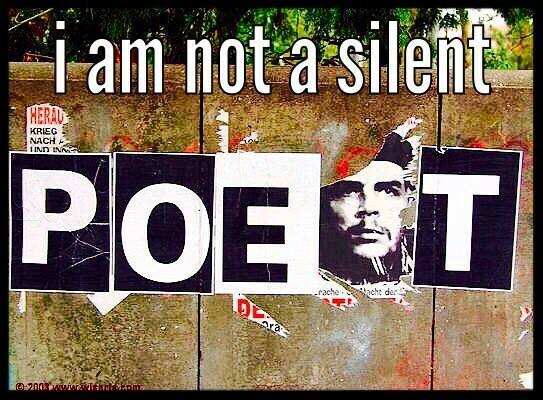 I am not a silent poet has received 157,173 hits in just over three years. It has published over 3,000 poems. The associated Facebook group page has 5,914 members, but you don’t need to be a member to visit it or to comment on any of the poems and links. It has given a voice to poets of protest against abuse all over the world. I’m not sure I could name a country where it has not been read. If you feel we deserve it, vote for us. I am not a silent poet is 3 years old today. The magazine has received 143,548 hits. The Facebook group page has 5,878 members. It’s grown quite a lot from the 50 original members! We haven’t done so badly, have we? I´ve been invited to participate in the 4th International Festival of Poetry in Marrakech, Morroco in April. I’m going to take mostly poems from I am not a silent poet. The Festival covers hotel and catering costs but doesn’t pay anything towards transport. Like most poets I’m rather poor and therefore I’ve set up a crowd funding to cover the flights. If you can contribute, I would be extremely grateful. If you can’t, don’t worry, I’m sure I go with your best wishes. For the refugee children who went missing in Europe. I’m proud to say that I am not a silent poet, which started on 29th November, 2014, has reached the total of 100,000 hits in just short of two years. Not bad for a poetry magazine! Thanks to all our supporters and readers! He harms himself who does harm to another, and the evil plan is most harmful to the …………planner. wash ourselves unclean as night. ………………………………………………..Arriving in atlantis, sweet, paraíso. I felt it was time to do something, but this was rather frustrating because of my age and family situation, there is little I could really do except write. However, there seemed to be few places where poems of protest against abuse can find a home and also where the response time is very short. Many of these cases require an almost immediate response, almost like a newspaper. This is why I decided to set up a blogzine for poetry and artwork about and against abuse of all kinds and where I could publish poems almost instantly (I think our record is about 3 minutes). These poems often demand that kind of response. What kind of poems fire you up? Poems where the heart, gut and mind are working together – both in the creation of the poem and in its reading. Poems which burn a light in the darkness. Poems which are not afraid. Poems which don’t need to rant to communicate what they mean. Slanted and subtle poems which come back to you at 3 am when you wake up and can’t get back to sleep again. And that is also a good time for writing those poems. In 2015 it was reported by the UN that there are 60 million refugees/displaced people in our world and I wanted to ask you if you think there are enough poets writing about it? I don’t think it’s a good idea to tell poets what they should be writing about, and I know that I would get very angry if someone came up to me and told me what I should be writing about. There is probably a lot more protest poetry being written than we are aware of, particularly at spoken word and performance events. Unfortunately, unless they are recorded on page or film many of these poems are going to get lost. Also, we are only aware of poetry being written and published in English and a few of the other languages of the world. What is being written (perhaps in secret out of fear) in Farsi, Arabic, African languages is generally unknown to us. This is something I am working on at the moment on I am not a silent poet. I want to encourage people from the countries where those languages are spoken (or refugees from those countries) to submit poems to the mag. I am guaranteeing their anonymity as I know, in many cases, their security is at risk. If they can find a way of getting their work to me I will try to publish as much as possible. I would need some kind of translation, but, if necessary, I’ll use Google Translator which might be enough for us to get some idea of the meaning. I respect how your poems individually humanise the statistical devaluation of a collective label the media gives to ‘refugees’ like they are one being. I wanted to ask what began this journey into human darkness and the victims of injustices? I almost never know what I am going to write about until after the poem has been written, and not always even then. The element of darkness is something I have always been fascinated by, whether the poem be socio-political or not, and, indeed, most of my work is not, at least not obviously so. I was rather surprised, in looking through my work, to find that I had written so many which were relevant to the refugee crisis. These, as you know, came together in skins which was published by Paul Hawkins and Sarer Scotthorne at Hesterglock Press early this year. What poetry magazines are you really digging at the moment? At the top of my list I must place Tears in the Fence, closely followed by The Lighthouse Journal and The Interpreter’s House – the fact that they have published work of mine might have something to do with that. Among the online magazines I would mention Ink Sweat & Tears, The Poetry Shed, And Other Poems, Goose, The Yellow Chair and, in its time, The Stare’s Nest. Again, the fact that they have published work of mine is purely coincidental. IANASP is a literary kiln for poets starting out and more established poets wanting to experiment more and I wanted to ask you who are three male and female writers who we should be looking out for at the moment who you feel deserve a spotlight burning down on their work (include at least one from each at IANASP). Marianne Morris whose book with Enitharmon, The On All Things Said Moritorium is brilliant. Christine Murray, the Irish poet, with quite a few pamphlets to her name. She writes a blog called Poethead where she publishes poems by, translations of other women poets. Gillian Prew, again with books to her name. She has also contributed to I am not a silent poet. Michael Mac Aloran, an Irish poet who mainly writes prose poems and makes my work look light and bright. He edited my first collection, the king is dead, for Oneiros Books. I published some of his recent work on The Curly Mind. David McLean, who lives in Sweden surrounded by computers and enormous dogs. He writes in similar shades of darkness to Michael’s work. I’ve also published some of his recent work on The Curly Mind. Debasis Mukhopadhyay. His contributions to the magazine have always been excellent and I really do think it’s time he were better known. Why is it important for poetry magazines like IANASP to exist? A simple answer. It provides a space for people’s voices and a voice for people who do not have one. How many people are visiting IANASP and why are they doing so? It must fulfil some need for people. Some of the readers must identify with the content of some of the poems. Also, for poetry readers in general, I am not a silent poet has poetry of many different styles, and very often of a very high quality. It’s also a good place for newer poets because they can find their poems alongside established and well-known poets. Statistics. Since the end of November 2014 until the moment of writing (I’ll update these figures when this is published) we have published 1,940 poems and works of art (the vast majority, poems). We have had 84,794 hits. The associated Facebook group page has 4,609 members. I know there are many countries, such as Turkey, Saudi Arabia, China, etc. which control or try to control people’s (especially writers’) activity on the social networks in an attempt to prevent dissent becoming public. If anyone wishes to submit their work to me for possible publication and actually finds a way to do so, in a message on Facebook, via email, in any way what ever… I should like to assure them that I will respect their anonymity in an effort to protect them from any repercussions that publication might have if the real authorship were to be known by the authorities in their country. I can’t do much, but I can and shall refuse to reveal these brave writers/artists to any and all authority. For the Syrian children living and dying under the bombs in Aleppo and elsewhere. From my book, skins, written for the refugees and published by Hesterglock Press. All profits for the refugees through the organisation, CalAid.